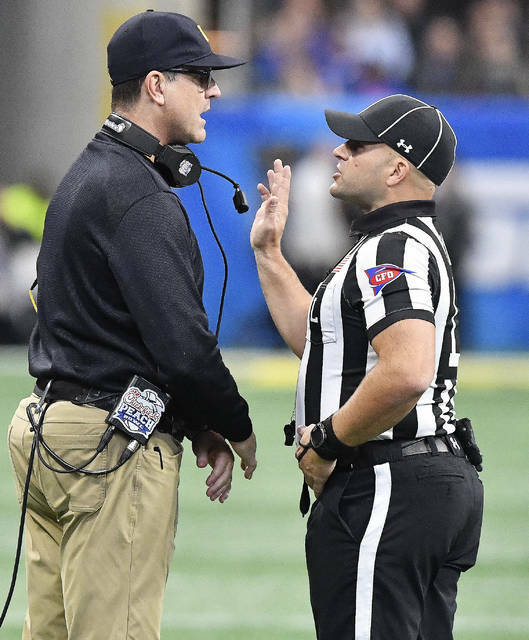 ANN ARBOR, Mich. (AP) — Jim Harbaugh shook up his coaching staff nearly a year ago as he entered his fourth season at Michigan. For a while, the moves looked good. The Wolverines won 10 straight games after opening the season with a seven-point loss at Notre Dame, raising hopes they may win the Big Ten title for the first time since 2004 and perhaps even more. They dashed those hopes with a pair of humiliating losses: 41-15 against No. 10 Florida in the Peach Bowl as the eighth-ranked team in the country on Saturday (Dec. 29) and 62-39 at Ohio State last month. Harbaugh said he doesn’t anticipate making changes again with his assistants this offseason. “I think we’re going to take what we have and reload,” he said. 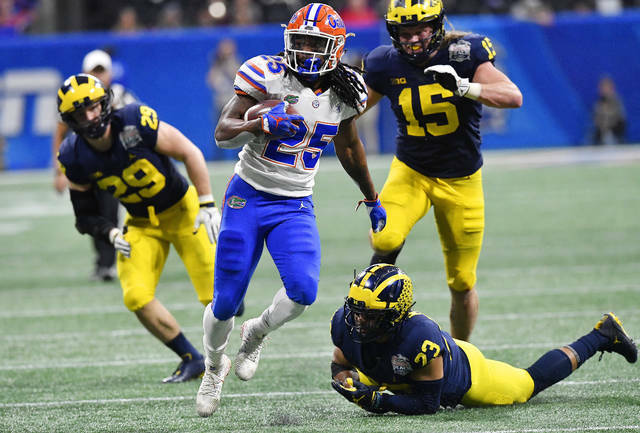 Michigan will return most of its starters on offense, which struggled to move the ball on the ground against the Gators without running back Karan Higdon and tackle Juwann Bushell-Beatty. Quarterback Shea Patterson said he’ll be back for his senior season, but he may have competition from Dylan McCaffrey and Joe Milton. Tight end Zach Gentry said he would decide after the bowl whether he will return as a fifth-year senior or enter the NFL draft. Before the bowl game, offensive guard Ben Bredeson said he was putting his professional football plans on hold to play his senior year. The Wolverines will have more holes to fill on defense, losing linebacker Devin Bush, defensive ends Rashan Gary and Chase Winovich, safety Tyree Kinnel and possibly cornerback David Long. Long has said he will decide after the bowl whether he will enter the NFL draft or return as a senior. On social media, cornerback Lavert Hill and safety Josh Metellus announced Sunday they’re coming back for their senior seasons. Unlike this year, Harbaugh will play rivals at home. Michigan hosts Notre Dame on Oct. 26 and plays Michigan State and Ohio State at home the following month. Harbaugh desperately needs to beat the Buckeyes after falling to 0-4 in the series this year. 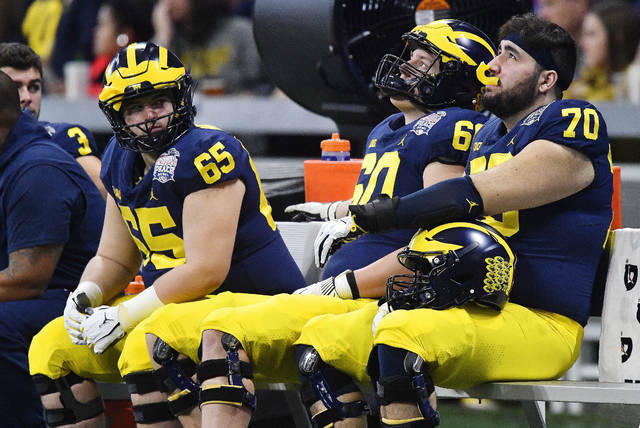 The Wolverines vowed to be motivated to play in the Peach Bowl even though they had much higher goals and were missing key players on both sides of the ball. If they were fired up to play, it didn’t show. Michigan did, in fact, bounce back after going 8-5 last season with a year that looked a lot like Harbaugh’s first two seasons, ending with a 10-3 record. And for the third straight season, the Wolverines lost their bowl game. While many will view the Wolverines’ season as a disappointment, Harbaugh insisted it wasn’t all that bad.